The Dallas Cowboys say former National Football League quarterback and longtime assistant coach Wade Wilson has died. Wilson played quarterback for 17 National Football League seasons with the Vikings (1981-91), Falcons (1992), Saints (1993-94), Cowboys (1995-97) and Raiders (1998). He played 10 seasons for the Vikings, leading them to the NFC title game during the 1987 season. Wade was a great teammate, a fantastic coach and a dear friend to so many in our organization and throughout the National Football League for over 35 years. Following his playing career, Wilson served as an assistant coach with the Dallas Cowboys and Chicago Bears. Wilson's ties to the Cowboys franchise span three separate stints, as both a player and position coach. Dallas Cowboys owner Jerry Jones said in a statement: "This is a sad day for all members of the Cowboys family as we have lost a truly great man". He also played for the Cowboys as a backup quarterback from 1995-1997. Wilson's contract ended after the 2017 season and he was not retained, ultimately replaced as quarterbacks coach by current offensive coordinator Kellen Moore. 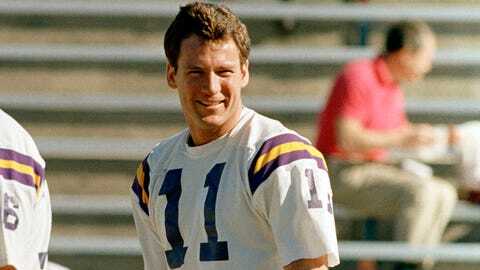 He started 48 games for the Vikings (active for 76), and his 12,135 passing yards still rank 4th on the Vikings all-time list. His best statistical year was 1988 when he led the NFC with a 91.5 quarterback rating and completed 204-of-332 passes (61.4 percent) for 2,746 yards, 15 touchdowns and nine interceptions. He helped develop Tony Romo and Dak Prescott during his time with the Cowboys.